DIY Monogramed Easter Basket The perfect preppy basket that you can use for household storage year round. DIY Princess Easter Basket Your little princess will love this basket. You’ll love the savings. Flower Pot Easter Basket Make your Easter baskets out of Terra Cotta Pots then reuse them for your centerpiece at Easter dinner. Everyone will want to come to your Easter party with these decorations. Burlap Bunny Table Runner Here comes Peter Cottontail, hopping down the…table? This rustic yet whimsical design is the perfect project for Saturday afternoon. Paint Sample Easter Egg Garland You only need to buy a piece of string for this decoration! Stop by your nearest paint store for a few free samples and you’ll have a party decoration in no time. Easter Peep Centerpiece Candy is everywhere this weekend, so why not add it to your centerpiece as well? Easter Egg Wall Hanging Don’t waste money buying seasonal home decorations. Make your own Easter Egg wall hanging with fabric scraps or colored tape. 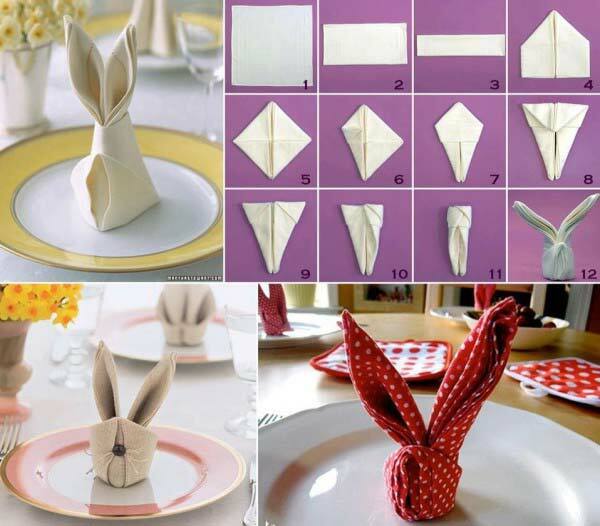 Bunny Napkin – Guests will love the Easter Bunny napkin at their place setting. Learn how to make one with this photo tutorial. Tired of the same old just-add vinegar dye kits? Try these Easter egg designs. Glitter Eggs These eggs reflect your inner diva. Sprinkle Eggs Sprinkles aren’t just for cookies! Put a whole new spin on your eggs with pastel sprinkles. Polka Dot Eggs Now these eggs have style! You’ll be the most popular person at Easter potluck with these fun recipes. Easter Egg Nest Cookies These cookies are cute and delicious. Sugar cookies + M&M’s? What’s not to love. Chocolate- Dipped “Carrots” No one eats their veggies on Easter. Dip strawberries in orange chocolate melts for a bunny-themed treat. Colorful Devilled Eggs Who said you can only dye the shells?